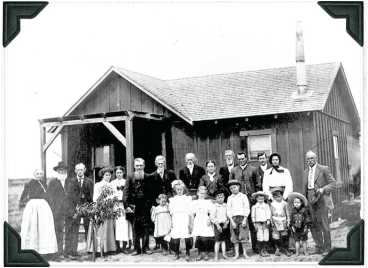 The story of Lomita’s first church begins on May 25, 1907, when W. I. Hollingsworth, Land Developer, showed the Lomita farm acres to about a hundred Brethren men, commonly known as Dunkards. M. M. Eshelman, a prominent elder who was attending the German Baptist Brethren Annual Meeting in Los Angeles arranged for the private showing. Eshelman bought land that day as did Emanuel Henricks, who was also at the Annual Meeting. Other Brethren planned to return to Lomita in the fall and it looked like it might become a Dunkard Colony. Mr. Hollingsworth donated two lots for the town church. Eshelman arranged for Rev. Zacheus Henricks, his son Emanuel Henricks and Isaac Root, all of the Midwest, to organize the new church work under the auspices of the Brethren denomination. When the church organized two years later, these Brethren founders were elected as three of the five directors on the board, but the church itself, Evangelical Union Christian Church, was independent and not affiliated with the Brethren denomination. The church was organized at Rev. Henricks’ home on April 12, 1909, and incorporated on June 30, 1909. The building was completed and dedicated on Sunday, October 25, 1909. Rev. Henricks, also a skilled carpenter, led the volunteer workers and did much of the work himself. In April 1917, the church consulted with the Rev. Dr. Charles M. Fisher, a Presbyterian minister. It was seeking resources for expansion of facilities and ministry. Rev. Henricks, who had served as pastor from the beginning was planning to retire to the Old Soldiers’ Home in Sawtelle. He was 77 years of age. Dr. Fisher recommended affiliation with the Presbyterian Church in the United States of America (PCUSA). As a mission church, there would be funds for expansion. So the congregation voted to become Presbyterian. The first Presbyterian worship service as First Presbyterian church of Lomita was held on May 12, 1918, with Rev. Fisher as acting pastor. Rev. Fisher resigned that fall due to poor health and passed away in 1921. Rev. E. E. Clark served from 1920-1925 and oversaw the building of a larger, modern edifice that was dedicated in October 1922. The church name was changed to Community Presbyterian to reflect its commitment to community. The congregation fell on hard times during The Great Depression. Three pastors came and went in ten years as the church struggled to stay afloat financially. The congregation also suffered the total loss of Fisher Hall (the original church building) in the fire of 1930. In spite of it all, they managed to build a new fellowship hall with volunteer labor and purchase a used theatre organ in 1932. By 1936 when Rev. John E. Orr arrived, the Nation was beginning to pull out of the Depression and was on the eve of WWII. Until the end of his pastorate in 1949, Rev. Orr stressed evangelism and stewardship and the congregation grew in numbers and turned its deficit into a surplus. Rev. Eldon Durham arrived in 1950 and served until 1968. During this time the church changed its name to St. Mark’s since it now reached beyond the community to other cities. The church purchased 3-1/2 acres on Pennsylvania Avenue and built a new campus with all-volunteer labor. The old property was sold and the first service was held in the fellowship hall of the new campus in May 1961. The current sanctuary was completed in June 1965. Rev. Durham’s legacy is the current campus–a base for doing ministry in the community and his message to “Go into all the world” working for peace and justice. Four pastors have served the church since 1968. Rev. Max Greenlee 1968-1981, Rev. Dr. Richard Miles, 1982-1997, Rev. Dr. Elizabeth Steele, 1998-2000, Rev. Dr. Judith Cuthbertson, 2001-2013, and now Rev. Billy Song , 2015 - present. Our very own Nancy Knapp wrote a book about our history called, "Lomita's First Church: A Century Remembered"